Star Trek's 50th anniversary in 2016 is already shaping up to be a huge event — but what about Lost in Space's 50th birthday, coming this fall? Like Trek, Lost in Space was an important part of science fiction TV history. 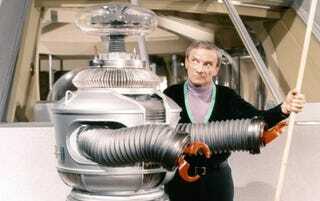 And Lost in Space had some seriously entertaining stories. So why doesn't this show get its due? Think about it this way: Lost in Space was on TV contemporaneously with the 1966 Batman TV show — they were actually in competing timeslots for a while. And in recent years, the prevailing opinion on Batman has swung from "embarrassing schtick that nearly ruined Batman forever" to "a pop culture treasure." Ten years ago, I'm not sure I would have believed a Batman 66 comic would be such a phenomenon. And yet, the equally silly and schticky Lost in Space seems mostly forgotten. There's been very little buzz about the upcoming anniversary. The show's being reissued at long last on Blu-ray and it's gotten relatively little coverage, especially in comparison to the Batman Blu-rays. Even the news that Legendary TV is developing a rebooted show got only a bit of buzz. Of course, part of the problem is that https://www.youtube.com/watch?v=llNnlE…Lost in Space went off the air in 1968 and has hardly been heard from since. An animated series only produced a pilot and was never aired, and then attempts at a live-action reunion of the original cast also fell through. The 1998 movie reboot was a huge, embarrassing flop. And the failed 2003 TV show, despite having a pilot directed by John Woo (!) and written by Buffy scribe Doug Petrie, is a pointless attempt to recreate the original show's storyline in the style of the WB network. But also, when people do talk about Lost in Space, it's usually to complain about the corny humor and repetitive plots. And a lot of it has to do with the comedy duo of the show's "villain" Dr. Smith, and the sarcastic Robot, neither of whom were in the show's original pilot. The latest issue of Famous Monsters of Filmlandhas a terrific feature on Lost in Space, which is jam-packed with details about the show's history. And the book Irwin Allen Television Productions, 1964-1970 has a pretty in-depth history of the show as well. In a nutshell, here's what happened. Irwin Allen was best known as a movie producer, the maker of The Lost World and Voyage to the Bottom of the Sea. (Later, in the 1970s, he would be famous for disaster movies like The Poseidon Adventure and The Towering Inferno.) But in the mid-1960s, he got into television, and at one point he had four TV shows in the works. The original Lost in Space pilot was a serious science-fiction adventure program, based loosely on the Swiss Family Robinson stories. The Robinson family go into space in an experimental craft, but wind up going off course, crash-landing on a hostile planet full of giant monsters and stuff. The pilot is a special-effects marvel, and the cast largely plays the adventure story straight. The network picked up the series on the strength of that pilot — but then Allen and the other producers decided the show needed something else. So they added the character of Dr. Zachary Smith (Jonathan Harris) as a "house villain" who could get the Robinsons into trouble every week. The existing pilot was recut to make Smith's sabotage the reason for the ship going off course (and include Smith becoming an accidental stowaway.) Becuase of the added material, the pilot was broken up and parts of it were used in the first four or five episodes of the series. The producers also decided to add a robot companion to the cast — and the Robot, designed by Robert Kinoshita, became one of the coolest robots in pop culture. Kinoshita had previously designed Robby the Robot in Forbidden Planet, but he made some major improvements to this newer design — Robby had a lot of problems navigating the ramp of his spaceship, so the Robot on Lost in Space got pivoting knee joints and wheels at his base, according to Famous Monsters. Allen saw Harris doing comedy, and told him: "Do more." As Harris explains in the above video interview, Dr. Smith "was not on the page." He was just a snarling, stock villain, but Harris created the character from scratch. And Harris' comedy turn as Smith changed the whole course of the show — it went from a semi-serious SF adventure to a zany comedy. Soon enough, almost every plot was revolving around Smith — either Smith's misdeeds get the crew into trouble, or some aliens get mad at Smith and he needs to be rescued. In fact, the show's second season almost entirely revolves around the trio of Dr. Smith, the Robot and Will Robinson (Billy Mumy), with the show's ostensible stars pushed way to the background. The tone got more and more comic, and dialogue was dominated by the Robot shouting "Warning, Will Robinson!" and Dr. Smith abusing the Robot with alliterative phrases like, "You bubble-headed booby." In the third and final season, an attempt was made to move the focus back onto the members of the Robinson family, plus daring pilot Donald West. But this had mixed success, with some episodes focusing on the Robinson daughters being generally regarded as a bit dull. Because the more serious (and beautifully realized) first season was in black and white, most people have only seen the two following seasons — and it's really the second-season format of Dr. Smith causing trouble for the Robot and Will Robinson that people remember. The show was never cancelled — CBS was all set to renew it for a fourth season, but they wanted to reduce the licensing fee and Allen pulled the plug rather than shoulder more costs for the show. So why should we celebrate this show? There are a couple of positive ways to look at Lost in Space. The first is as an important stage in the development of science fiction television — this show helped prove that you could do spaceships and planets on a TV budget, and was an bridge between the 1950s shows like Captain Video and Rocky Jones, Space Ranger and later efforts like Trek and Space: 1999. This show probably had the first regular robot character (and maybe the first non-human hero) on television, and imported a lot of space-opera movie tropes to TV. Plus, by being such a straightforward "scifi" sort of show, with all of the goofy rocket-ship stuff and the silver spacesuits, Lost in Space gave later shows in the space subgenre something to react to. It was easier for those later shows to break the mold, because Lost in Space had perfected the mold, sort of. But also, there's something wickedly entertaining about a show that's so joyously campy. The fact that this show has a "villain" who becomes the most compelling character, around whom everything starts to revolve, is kind of awesome. And Dr. Smith is a precursor, in a lot of ways, for the legion of camp "baddies" who became some of pop culture's greatest heroes — from Dr. Frank N. Furter to Damon Salvatore. As silly and goofy as Lost in Space becomes, it's also weirdly transgressive in its exploration of human foibles, and Dr. Smith is kind of an epic clown as well as a trickster figure who makes the show's weird adventures possible. He's exactly the sort of self-serving, ridiculous character who shouldn't be on a fancy sleek spaceship, exploring the cosmos. On Star Trek, Dr. Smith would be a semi-recurring nuisance — like Harry Mudd, for example. But the idea of building a whole show around a Harry Mudd figure is sort of fascinating. Lost in Space is definitely a product of its time, as much as Batman or Star Trek are. But the show managed to get seriously weird at times, like in the early episode "My Friend, Mr. Nobody," where Penny Robinson befriends a creepy disembodied voice. Or the trippy "Magic Mirror," which is full of goat heads and "sexual angst." A lot of 1960s pop culture looks kind of retroactively subversive when viewed through a postmodern lens — all those weird colors, all that loud blaring cheerfulness — but Lost in Space's vision of a totally ill-prepared family blasting into space with a demented egomaniac along for the ride is intrinsically subversive, when compared to more militaristic (or professionalized) views of space exploration. Basically, Lost in Space is the apotheosis of camp — and it's a gloriously weird vision of our future among the stars.